This second trap 'n' blog season is getting like a school reunion. On Monday, the first White Ermine of 2009 turned up, followed on Friday by a Peach Blossom. 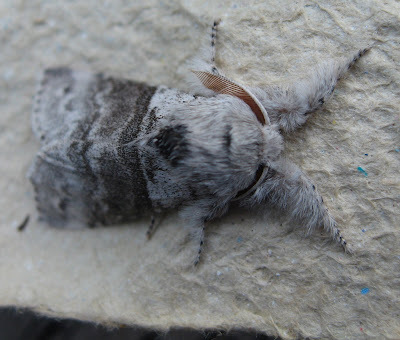 On cue, the first Buff Arches was dozing in an egg box this morning, a close relative of the Peach Blossom although they look like chalk and cheese. Both are a reason for sparing a few brambles in your neighbourhood, because that's what they eat. This applies forcefully to nettles as well, which sustain the caterpillars of some of our most colourful butterflies, the Peacock, Red Admiral and Small Tortoiseshell. Another welcome visitor, also very much on cue: the first hawk moth of the season. It's a Poplar Hawk and shows exactly the ability as its predecessors last year to squash itself gymnastically into snug spaces in the carton pile. I've been scrolling back to last year to answer my American friend Sarah's query in her comment on the post below. In the process, I came across the entry last July (14th, Vive la France!) about finding a female Green Silver Lines moth snoozing on my Mum's front door. I brought it home to photograph and ended by speculating that we might have started a colony here. Well maybe we have. I'd forgotten about this episode when I posted four days ago about finding a lovely male Green Silver Lines in the trap. Thus distribution can work, although in this case, the distance is only about three miles. 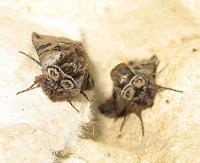 Meanwhile, last night brought two apparently very different moths which are actually both Pale Tussocks - fine, hairy beasts with lovely antennae (click on the big pic - they look like quill pens). The dark one, which scarcely seems to deserve the title Pale, is a melanistic version and an interesting indicator of the way Britain's old balance between sooty North and rural South has evened out. Melanistic Pale Tussocks are much commoner in the South these days, while the melanistic version of the Peppered Moth (much discussed in past posts here) is much rarer in the North than it used to be. Excellent. This other, pleasantly patterned moth which also came last night is a Common Swift, one of the five of the 500 swift moths in the world which live in Britain. They are unusual in having no proboscis and therefore do not eat, but their caterpillars make up for it by overwintering for two years before pupating. The caterpillars hatch from eggs which the Common Swift lays in flight, skimming low over a foodplant (luckily the favourite is grass roots). Imagine: starting your life as a tiny bomb. I was going to introduce you to last night's Bronte Family of moths which came to the trap - all governessy brown, grey and black and apparently dowdy, but on closer inspection having wonderfully delicate and subtle patterning. 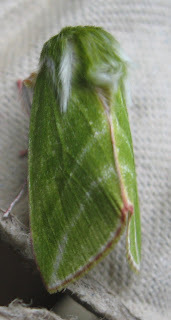 But then I got to one of the last eggboxes and found this: the annual delight of the season's first Peach Blossom moth. It's one of the best arguments for taking an interest in moths, a common but beautiful visitor which most people never see. The colouring is very effective camouflage on the lines of 'dazzle' warships (see one of last year's posts, complete with exciting illustration), but I've tried to photograph it so that it stands out a mile. I've just discovered, through the usual serendipitinous of Google, that there is a Peach Blossom Island in a lake in eastern China, known for its beauty but also as the setting for a novel by Jin Yong (Louis Cha) called The Legend of the Condor Heroes. The plot takes place on a mysterious and beautiful island filled with peach blossoms and secluded from the outside world. Given the global distribution of the Peach Blossom Moth, I bet (and hope) that they feature too. I'm just back from a couple of days at Hay on Wye, helping to promote Guardian Books (check out books link above left, and spend, spend, spend...) It's been raining too, though the prospects look better for tonight. 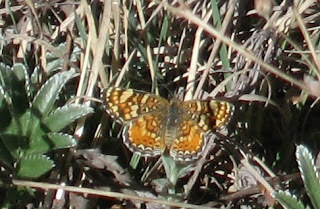 So here's a picture from three weeks ago of the highest butterfly I've ever met - a Field Crescent near the tramway station at 10,386ft on Mount Sandia above Albuquerque in New Mexico. I know what it is, thanks to the completely brilliant website Butterflies and Moths of North America which I mentioned a couple of days ago - www.butterfliesandmoths.org. 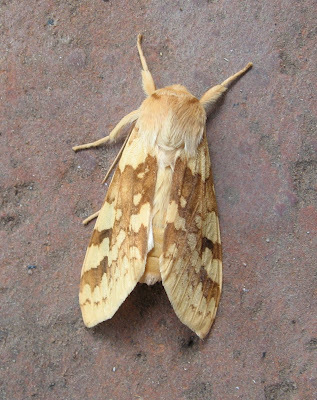 A couple of emailed pictures, and their moth monitors for New Mexico, Paul Opler and Steve Cary, were back on to me with the details (also of the moth I posted the other day, which - yo for my faltering identification skills - is indeed a Spotted Tussock). Many thanks, guys. Ain't the modern world grand? It would have taken weeks, pre-internet to track such things down in books. While discussing high-fliers, here's another picture taken by my son Olly of a butterfly visiting a lofty windowsill on the Royal College of Art in London - late afternoon by the length of the shadow. It obviously knew where it was going - it's a Painted Lady. btw the Field Crescent isn't my highest-ever insect. 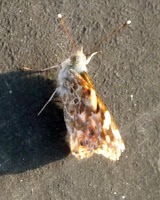 That was a moth which was on the same flight as us from Manchester to Skiathos a few years ago. I thought things were going to be a dead loss today, after rain in the night and with the trap apparently empty. 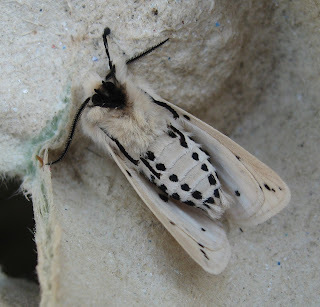 But no; hidden beneath the egg boxes were some interesting arrivals: a Peppered moth (for the third night running), two Scalloped Hazels which look like the latest stealth creation from the United States Air Force, an Early Thorn, and this. This is a Green Silver Lines, not rare but a favourite of mine because green is an unusual colour in British moths, and it suits both them and the general greenery of our rainsodden landscape. It's a male - they have the pink skirt to their wings, as well as pink antennae. Initially, I thought that the white lines on the back of the head were feathery antennae laid back like the ears of an angry horse. 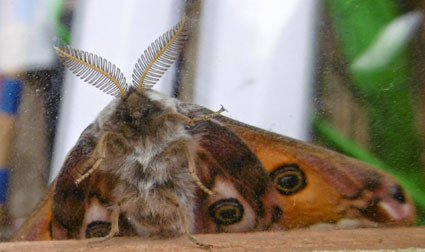 But they are actually part of the moth's delicate patterning. One of the interests in trapping is seeing if results vary in different parts of the garden. Because rain was forecast, I more or less hid the trap under a rhododendron and a daisy bush. Maybe that's where Green Silver Lineses like to hang out. Bank Holiday Sunday was blissfully sunny, but ended with another cold night and the Maybugs dominated again, with only a few moths for company. Among them was this White Ermine, hanging nonchalantly by one leg from one of my increasingly tatty egg boxes. 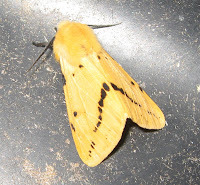 It's interesting to see how its patterning continues over the body from the wings; something which also happens with the ermines' relatives the Tiger Moths. Why? They're sending a message to predators: I'm pretty, but poisonous. Well it's May, and you're a Maybug, and you meet another Maybug... At least, I think that's what is going on here. I tip-toed away and photographed the other eggbox residents: a fine Peppered Moth, several littlies which I need to identify, plus today's pictured ones: a nice Buff Ermine and two Spectacled moths holding an owlish conclave. They were outnumbered by other Maybugs (aka Cockchafers) but it was a cold night. This morning is lovely by contrast. We look set for a fine day. It won't be the Maybugs' only one in this world, incidentally. The belief that they live just for one day is offbeam; usually they manage five or six weeks. They are also a good counter-indicator of pollution because they like things to be clean. So that's good news for Leeds and my garden. Gaudeamus/Wahoo - it looks like we're going to get some dry nights. So this year's trapping starts now. Actually it started a little bit earlier, with this moth which was staying at the Sagebrush Inn at Taos, New Mexico, at the same time as Penny and myself two weeks ago. The States was great for butterflies especially, but I couldn't get near the great big, flapping Swallowtails which swooped around. This moth was a different matter. It was unwakeable, maybe after a late night on the lilacs which honeyfied the whole hotel. Thanks to the modern wonders of communication, I'm fairly sure that it's a Spotted Tussock, also known as a Yellow-spotted Tiger Moth, according to the quite outstanding website Butterflies and Moths of North America, which must have been early in the IT field because its address is www.butterfliesandmoths.org. I think I'm modestly outstanding too, because I clicked on the Spotted Tussock first of all from the vast list of moths they offer from New Mexico. It has a slight resemblance to our Tussock moths. Thanks btw to very kind readers who wished me a happy birthday. You can't escape age on the web. As May 18 dawned, or at least before it ended, this blog automatically shifted me on to 59.